Where are you seeing color written? 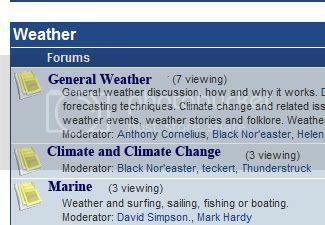 My first reaction to a changed website or forums is always "oh no they changed it" but after playing around with the new weatherzone forums I'm liking the changes. My only question is please bring back The Briefing Room, the new forum structure is good but why fix something that isn't broken? Sorry, I meant the spelling, it was a joke really..
Not too happy with this new layout / look , its all to busy.. I will get used too it though .. Yes, please bring back Forecast/Reports section. A lot of people do not have the time nor energy to sift through all the crap out there. Oh yea love the satellite image on the far right hand side of the forums, nice touch. Don't suppose you could add one for Radar? Or perhaps a custom flash application that you could change the location of the satellite/radar? I am also concerned about the combined threads. One thought in particular fo SEQ is to make sure we have one thread per day. If we can look at the first few pages for forecasts and last couple pages for post even analysis/reports it wouldn't be much of an issue. If we have a multiday event where storm reports from a previous day get mixed up with dozens of 'wow red radar echo at X' comments for the next day that would be more annoying. The other idea is to have an 'experts' forum or threads that only experts can post forecasts/post event analysis in. Not sure what problems might arise with 'who gets to be an expert' issues. Not sure if this has been mentioned before but on the side under 'Who's online' what or who is a Spider? If life was a synoptic map it would be full of highs and lows. I have a feeling that the hamster that ran the the old forum has been replaced by a legion of spiders. You know what they say, eight legs are better than four! Great job with the tweeking, I like it. ...can I suggest that the now "white" background in each thread is a little bright. Last night the light blue (Which is still present in the main forum list) is a lot easier on the eyes. I second that one as well. And just another minor alteration I'd like to see changed, the colour of those buttons 'Reply', 'Quote' etc, it might be better if the colour of these matches the new lighter blue colour that separates each post, might make things look a little 'less busy'? FWIW i've seen moderators not using these rooms correctly on more than one occasion! ...my only concern is that when first entering the forums I'm having to squint a bit to try and see each sub heading, I think it might be a bit of problem for those with poor eye sight, or those who just want to quickly navigate through each page below is just an idea that would fix this and should be very easy to fix. [Edit] After looking at the main page again, I also agree with Luke, the room headings should stand out more IMO. That is probably a search engine spider collecting information for its search database. Yes I'm loving it now...I just wish the forum stretched wider like the old format, but no biggie. Me too Mega. The wider reading format was good... I guess you get used to something, and then have to spend time adapting when it changes. I have to agree that a separate room needs to be created for a briefing room. It is rare that I will post in a briefing room thread but I do go into them and read them and learn. The chit chat is cut out and the language is specific and to the point. (mostly). They are usually slower moving too which is good to absorb what the more experienced weather observers are saying. The wider format was great but I understand the need for advertising too. Good job on the change just don't do a Facebook and change the format every 2 months. Just a quick comment. I haven't been visiting the forum very often over the past few years....after 4 years of drought it gets a bit depressing reading about rain elsewhere. But when I did visit to check up on a few events I just found it hard to follow an event in both BR and BWU. To me it makes more sense to split everything into weather areas and have one thread per event. Then you go to the area of interest and hopefully posts will happen chronologically and tell the whole story of what happened....the first pages will mostly contain forecasts and speculation, then comes the posts about what's happening, then towards the end would come the photos and trip reports. Sure, there's a bit of drivel to trawl through, but I think it's better to scan through one thread for the posts that interest you on a particular event than have to swap between several to follow the excellent stories and images people post here. I totally agree with you Powerin. Very well said. How often was the BW or BR threads used for the wrong things etc. I think you will find, as Powerin said, an order of forecasts, then event reporting, then post event discussion. All this complaining about joining the threads when they were hardly used properly in the first place and, to me, hardly served a purpose to have 2 separate threads, seems silly. All all this stuff about chit chat, well take it upon yourselves to cut that stuff out. We're looking at a bit of a compromise regarding the separate thread business. Powerin's post largely reflects my views on the matter however just as encouraging people to use the correct BR/BWU thread has proven impossible it also seems encouraging the more excitable posters not to chatter mindlessly or post the bleeding obvious is also impossible. The current SE Qld / NE NSW thread has sufficiently demonstrated this. So, what we're looking at is maintaining the general idea that events will be discussed in one thread but the option of creating a 'technical discussion' thread next to (i.e. in the same regional forum) the normal thread will be available where necessary (as agreed by posters and moderators). Often this won't be required (e.g. run of the mill NSW/Vic ranges snow events) but sometimes it will (e.g. thunderstorm events affecting areas with an abundance of posters who are not out chasing). We'll refine this idea further if/as necessary to keep the most people happy. Logged on last night and nearly fell off the stool! So I started on this thread to see what its all about and think the new system is great! (I'll soon learn how to put a smiley here?). Re the Briefing Room/Breaking weather change, the opinions differ just as they did when we went from "this" style of system to it years ago. I hated it at first and got used to it. So I cant whinge about returning to it again can I. Everything seems to work, like the layout, as good as or better than other forums with "newer type engines" and the transition is a credit to WZ. The gap to the left now that I'm "low" into the thread seems to be wasted real estate though. WOuld prefer to see more posts/photos per page even though the chart (when visible) is a nice touch. 7 registered (bd bucketingdown, Mike Hauber, Homer, Multiversity, Mcbobbings, Snowmaker, 1 invisible), 60 Guests and 3 Spiders online. Generated in 0.030 seconds in which 0.005 seconds were spent on a total of 14 queries. Zlib compression disabled.